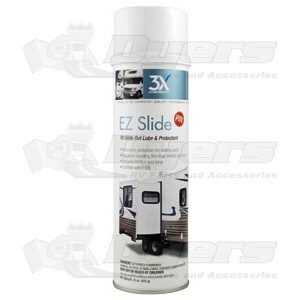 3X:Chemistry EZ Slide keeps RV slide outs moving freely and smoothly without gumming up or staining. Protects delicate assemblies from rust and corrosion using superior PTFE moisture-displacing technology. Test on hidden area first. Spray slide rails and exposed metal parts freely with a moderate, even coat. For optimum performance, repeat regularly. For hard to reach areas, insert extension tube provided and spray freely. Protects: Offers maximum protection for expensive slide out mechanisms. Coats: Repels moisture as it protects with a special lubricating barrier action. Seals: Leaves a moisture-repelling film that inhibits corrosion. Lubricates: Reduces friction with a non-greasy lubricant and advanced corrosion inhibitor. Contains no chlorinated or fluorinated solvents. Fortified with PTFE.